Education is the transfer of knowledge from one generation to another generation through various means. In our country, India, still today the level of education has not been able to achieve the expected mark even after nearly 66 years of independence. Knowledge which comes from education is that asset, of which nobody can rob you. It is the safest and the most important precious thing in one’s life. In Rural India, even today the school enrollment percentage is too low when compared with global standards, and in case even if a child is enrolled in any school, he or she drops out from the school before even passing the secondary school examination. Thus we find school dropout percentage exceeds enrollment percentage. These children devoid of education, coming from poor families, have nothing in their life for its betterment. It’s a fact, most of children who are enrolled in government schools in rural India are enrolled because they want to avail the facility of mid day meal and if we talk about the food which is given to these hapless children, I have just one world for that food and that word is “pathetic’. Education is quintessential for economic, social and human development, it is a profitable investment for any country because education enhances the human capital of a country and thus brings that country on the path of development more steadily. Not only this, increase in literacy also leads to better health care, smaller family norms, greater political and community participation, less income inequality and a greater reduction of absolute poverty. We all are aware that dogmas and other irrational beliefs exist in our country and lack of education is one of the most important factor of various social problems which our country is facing today like “communal-ism”, “caste ism”, “sectarianism” etc. And I believe, the most potent way by which we can overcome these social evils is “EDUCATION” and we have to make sure that education is imparted to one and all irrespective of their social or economical backgrounds than only can we have “all round development” of India. It’s high time now that we take steps from our own side that whatever we may do and in whatever way, we shall make sure that we are spreading the light of knowledge among the children and youth of underprivileged section of our society because even they have a right to lead a good and better life. We can’t just blame the government every time for its lethargic attitude, if government is characterized by lethargic attitude our attitude should be characterized by being energetic and even government is taking steps to ensure educational, thus overall, development of every child. 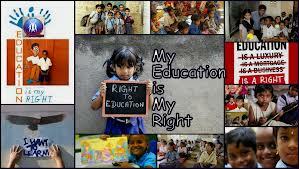 The enactment of Article 21-A and programmes like “sarv siksha abhiyan” and inclusion of right to free and compulsory education in the “fundamental rights” category are best example of government’s achievement in this crucial field. If government is doing its bit than it becomes our responsibility to perform our bit because a country is managed and I emphasize smoothly managed not just by government but by people in cooperation with government because just by casting our vote we don’t become a “real” citizen but we can only become citizen in real sense when we participate in the cumbersome task of nation building and the fruits of which should reach every single citizen of this country.